Camilla invited me to create a sketch for the norwegian online magazine StamARTic. Of course I happily accepted (what did you think?? haha) What an honour! 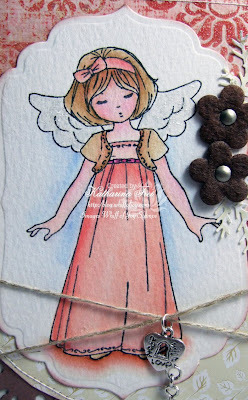 She also interviewed me about my crafting and about my company Whiff of Joy Stamps. So if you want to know more about me and my dream coming true, don't hesitate to read the article :) And maybe you'll also find the time to try the sketch I created. Camilla hat mich eingeladen einen Sketch für das norwegische Online Magazin StampARTic zu entwerfen. Natürlich habe ich eingewilligt (was habt ihr denn gedacht?? haha) Eine wirkliche Ehre! 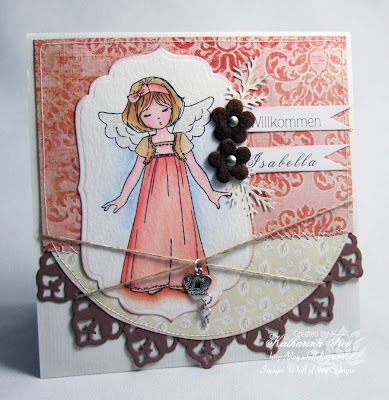 Sie hat mich ausserdem zu meinem Hobby und meiner Stempelfirma Whiff of Joy Stamps interviewed. Wenn ihr also Lust habt mehr über mich und meine Leidenschaft zu erfahren, zögert nicht den Artikel zu lesen :) oder den Sketch zu probieren. The birth of my goddaughter Isabella is due in mid April ( I am already so excited what she will be like :) I created a CD-Mailer card for her. The CD includes a variety of lullabies which I loved to use for my own children. Die Geburt meines Patenkindes Isabella steht Mitte April bevor (Ich bin schon so aufgeregt wie sie wohl sein wird :) Ich habe eine Karte mit enthaltener CD für sie gebastelt. Die CD enthält eine Reihe von Schlafliedern, die ich meinen eigenen Kinder gerne vorgespielt habe. I coloured Confirmand Melinda with Supracolor water soluble pens and Twinkling H2Os. There are stickles on her wings. Ich habe Firmling Melinda mit Supracolor Aquarellstiften und Twinkling H2Os coloriert. Auf ihren Flügeln sind Stickles. I decorated the inside with a simple flap to put the CD in. Die Innenseite habe ich mit einer simplen Lasche beklebt um die CD einstecken zu können. 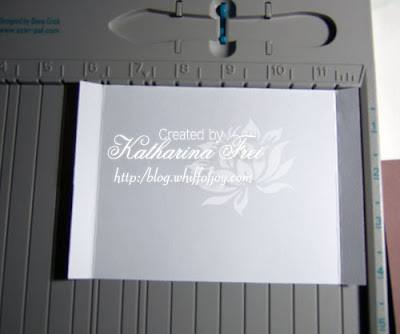 I simply used a piece of design paper and cut it in the same width as my card plus 1cm on both sides (to glue it to the card) and 2/3 of the height. Ich habe einfach ein Stück des Motivpapiers in der selben Breite wie die Karte (plus 1cm auf beiden Seiten zum Festkleben) und 2/3 der höhe zugeschnitten. 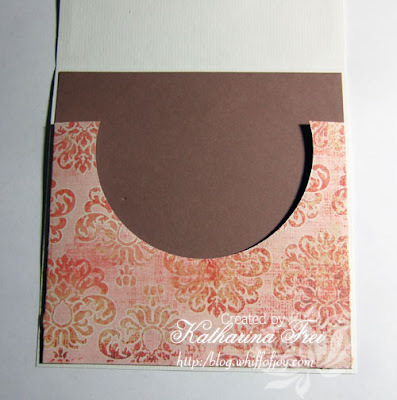 I did the halfcircle with my round Nestabilities and used double-sided adhesive on the 2 flaps and the bottom to adhere it to the inside of the card. Den Halbkreis habe ich mit meinen runden Nestabilities gemacht und doppelseitiges Klebeband auf den 2 Laschen und am unteren Rand verwendet um die CD Tasche an die Karteninnenseite zu kleben. I used a printable CD and simply printed the card-cover on it. The name is cut with Cuttlebug's "fancy pants" alphabet. Ich habe eine bedruckbare CD verwendet und einfach das Cover meiner Karte draufgedruckt. Den Namen habe ich mit dem Cuttlebug Alphabet "fancy pants" ausgestanzt. Hier ist noch ein Photo von dem Inneren meiner CD-Karte. 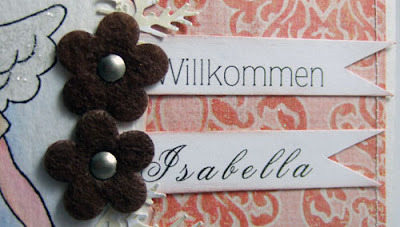 Ich habe wieder Spellbinders Labels 4 und die "old Lace" Borderability verwendet und ein paar Halbperlen aufgeklebt. Thanks for reading through this absolutely long post...LOL I hope you liked my version of the sketch :) Don't forget to visit StamARTic to have a look at the phenomenal creations of the DT. Danke, dass ihr euch durch diesen absolut langen Beitrag gequält habt ...haha Ich hoffe meine Version des Sketches hat euch gefallen. Vergeßt nicht auf StamARTic vorbeizusehen um euch die tollen Werke des DTs anzuschaun. Katharina! This is amazing! I LOVE this. Thank you for the tutorial. I will be trying this out for sure. 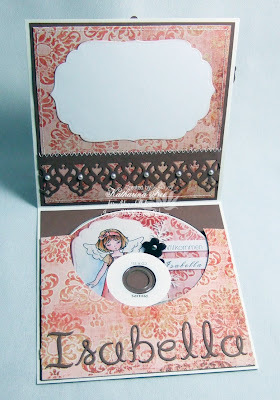 I love to create compilations for my friends and family. Now I can combine my two hobbies! This is a wonderful gift for your Goddaughter and her parents. You are so thoughtful! She is a lucky girl to have you as her God-mother. Oh! this is so nice! And what a great idea!! 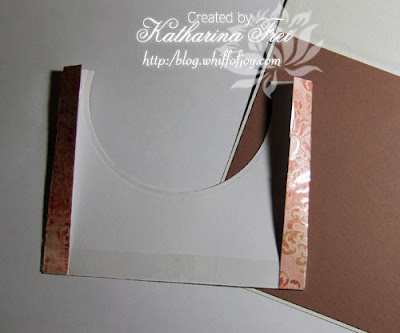 I like the idea that I can make this when I have cards that are sort of bulky. 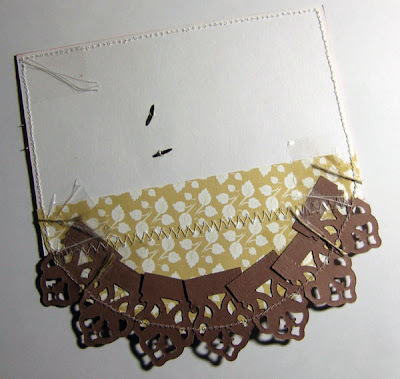 Any suggestions for making an envelope when cards are bulky with ribbon and embellishments?? I'm gladly open to any suggestions for you and all you viewers out there! Ohhh... this card/CD holder is adorable!! I love how well done it is, down to the small details and the inside too! Great colors and coloring, and the CD was a great idea for a gift! 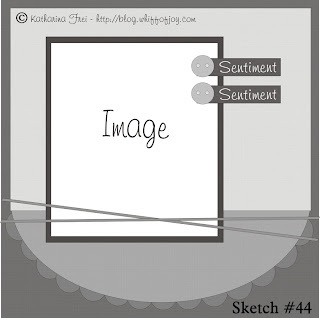 Thank you so much for being our guest at the sketch challenge! Hope you will join us as guest later on too! Gorgeous Katharina!! 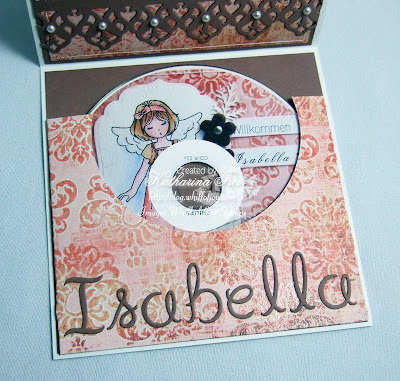 What a wonderful keepsake for Isabella!! Love the new nesties too!! wow what an amazing card! well cd holder hihi. you seem to amaze me every time katharina! This is just so very lovely and such a beautiful gift! Dein Sketch ist toll geworden und Deine Karte ist echt ein Meisterwerk. Super! This is really beautiful!! What a lovely gift for the new baby!! I love this idea and your project is wonderful!! Congrats on the interview and sketch in the mag. You deserve it!! Just stunning Katharina and a great tutorial, thankyou! Oh my! I love this sketch...your card is awesome...not to mention the CD!! Wow! I really hope I have some time to make a card with your sketch. I just love sending CDs to friends. I love your version of the CD holder. So cute. Your goddaughter will love it! I really like the twine/fibre you used. Thanks for showing me how you did the pretty scallop around the circle. This is fabulous, gorgeous gift and what a fabby sketch.